"I feel the storm is coming...."
The above info came from C.M, and was edited by yours truly (contact me). 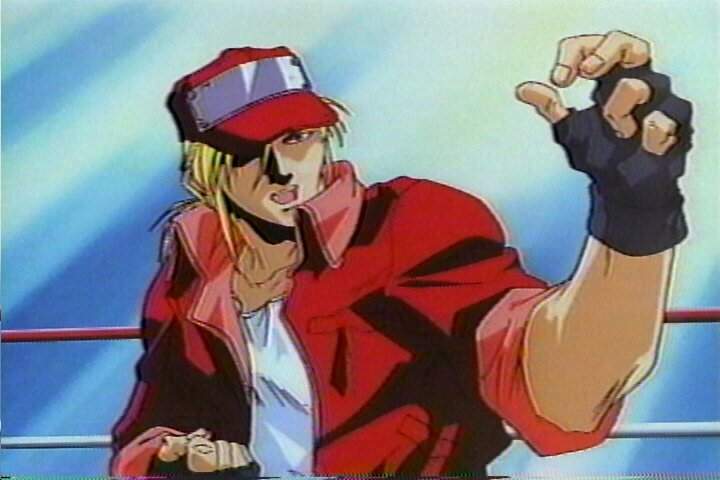 Terry Bogard is a martial artist/street fighter who fights to avenge his father's death (who was killed by Geese Howard). His master sends him and his younger brother, Andy, on a training journey to perfect their techniques. Ten years later, Terry and his brother meet up with their master for a reunion. It is then that he tells them that he will only choose one of them to be his disciple. They must prove who is the better fighter. Along the lines Terry meets a woman named Lily, who works for Geese. Come to find out she helped to kill his father. Terry meets Thai kick boxer Joe Higashi, and Terry, Andy, and Joe sign up for something called the King of Fighters Tournament. There, Geese tells Lily to poison Terry, and she almost does it, but then she decides not to and they kiss. Terry almost wins the fight, and just as he and his brother are about to fight each other, Geese tries to shoot them. But Joe ends up taking the bullet in the shoulder. Lily tries to help them escape, but just as she is about to escape, Geese catches her and kills her. Terry sees the whole thing and feels horrible. His master is wounded, and goes in to a comma, but just as Terry is about to go fight Geese, his master comes out of the coma and tells Terry he is the chosen disciple. He takes Terry outside and he teaches him the strongest techniques of Hack-Yo-Ko-Saken, the Sen-Po-Ken (Hurricane Punch). He dies teaching him the technique. Terry goes to fight Geese and defeats him, but he feels empty because of Lily. That is when he decides to dedicate his life to fighting. Later on, Terry meets a boy named Tony who wants to become his disciple, but Terry says no. Just as he and Tony are leaving, a guy named Wolfgang Krouser attacks Terry. He defeats Terry, but Tony tells him it is only because Terry was worn out from a fight with Kim Kaphwan, and that he wasn't at full strength. Krouser tells him to come and fight him in Germany. Terry is to scared and chickens out, but after Joe is hospitalized with 24 broken bones because of Krouser, Terry decides to fight him. Terry goes to visit Joe in the hospital, where he meets Mai for the first time. To make sure he is ready to fight Krouser, Terry ruthlessly fights against Andy. Terry wins, and Andy is badly wounded, but is okay. Terry fights Krouser, and wins, but he doesn't kill Krouser. Because Krouser is defeated, Krouser kills himself. About a year later, a girl named Sulia Guadomus finds Terry and asks him and his friends to help her with a problem she has. Her brother, Loucorn Gouadomus, is trying to find the armor of Mars, which will turn him into a god. She, Terry, Mai, Andy, and Joe travel around the world to find the three pieces left before Loucorn does. But in the end, they don't beat him, and he becomes a god. Terry, Joe, and Mai all fight him, but to no avail. Sulia stabs a stone into her chest so her brother can be defeated, and Terry kills him. But Sulia dies, and Terry is once again left empty inside because he had fallen in love with Sulia. But just as they think the fight is over, the armor takes the form of Mars, the god of war. The only fighter able to fight him is Terry, and in the end, Terry wins. The above description came from C.M, and was edited by yours truly (contact me).